Plant 3 per metre single row or 5 per metre double staggered hedge method. Animals may eat the hedge, not so suitable for hedging around livestock. Performs poorly at coastal locations. 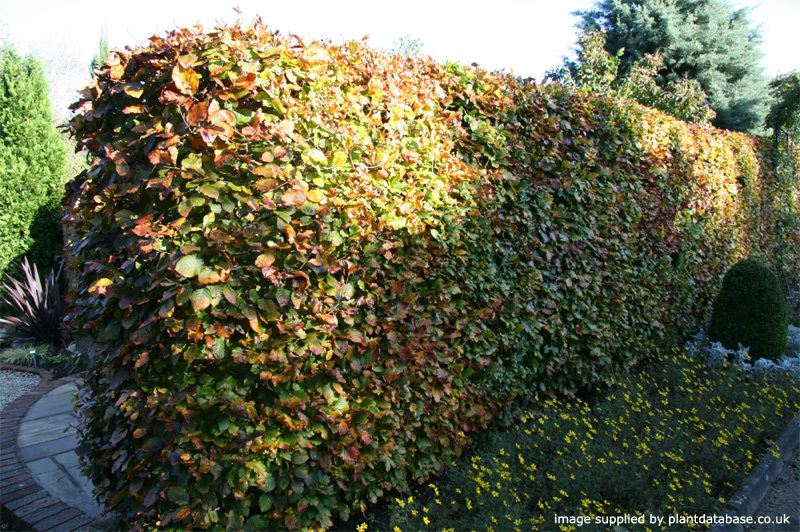 Common Beech or Green Beech (Fagus sylvatica) makes a great hedge, growing approximately 30cm (1ft each year), retaining its coppery leaves throughout winter and only loosing them when new leaves develop in spring. It can be either an attractive formal hedge or act as very good windbreak. Should you leave the common Beech to grow on its own and with the right resources it can grow to around 45+ metres with a 3+ metre thick trunk which is obviously no good as a hedge unless you have extremely tall and nosey neighbours. At the 10 year point, which is considered the end of tree adolescence it should stand around 4 metres if it has been left to grow. Should you be one of those people that are going to freeze their body and come back when science can build a microwave big enough to defrost you then you might be pleased to know that Common Beech can live around 200 years so your pride and joy will still be there (it may need pruning though). The bark will be smooth and a silver to grey colour and if left to grow as a single specimen or ornamental tree will have a different shape to those that grow in the forest as there is competition for light. The forest Fagus Sylvatica will have more of an upright shape whereas the single stand alone tree will be more spreading e.g. longer branches that head out and not up. When in the forest, the Common Beech does not let a lot of light through and can actually grow fast enough and tall enough to kill off surrounding tree by starving them of light. If you are considering companion planting underneath a Beech tree hedge we suggest planting on the South side of it. 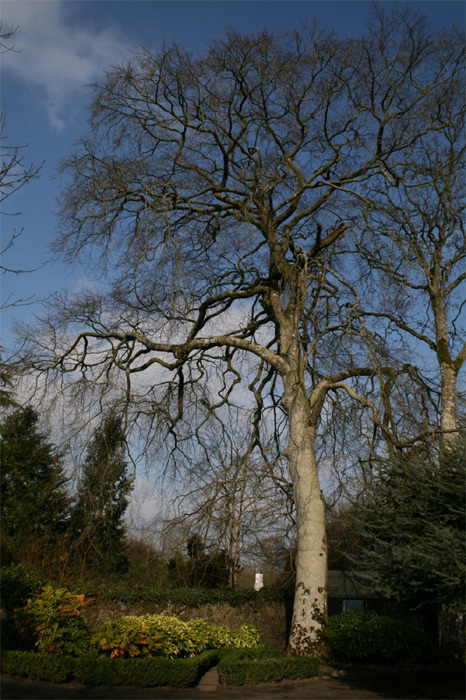 Fortunately for those people out there that do not have a clue as to when, where and how to prune, the Common Beech can be pruned hard at any time. To ensure you are not wasting your time and the trees energies, we suggest pruning before bud break in Spring or after it has stopped growing in November. The root system of a Beech tree is very shallow sending them out in every direction. This is important to know if your hedge is struggling from lack of nutrients and you have lots of weeds and/or grass growing close by as they are probably taking what the tree needs. Either remove them, feed the tree or both. Common Beech works hard in the summer and Autumn collecting resources to prepare for the following Spring. A good rainfall in Summer will determine leaf quantity the following Spring. 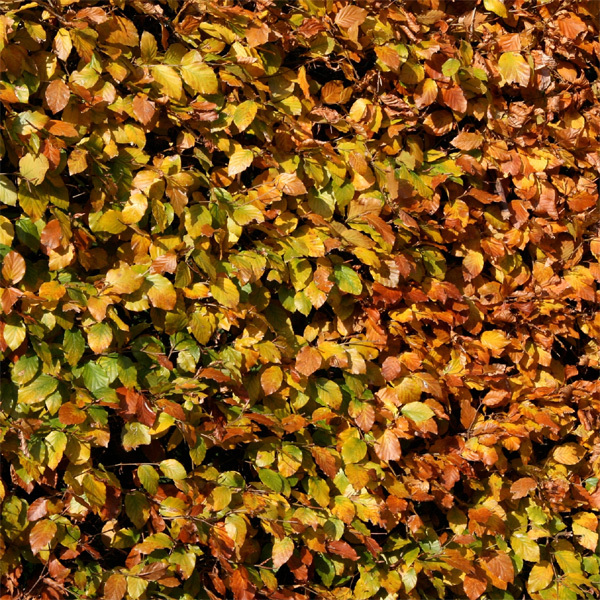 Historically grown as a timber resource, Fagus Sylvatica has become a popular hedge tree because of its dense growth and semi-evergreen leaves. This means the leaves still turn brown as most other deciduous trees do but they remain on the tree until the new Spring growth pushes the old ones off. A bit like redundancies, last in first out! The wood is a good choice as it is very versatile. It has a short and fine grain that is easy to dye, glue and varnish with mechanical properties resistant to compression and splitting although not enough to be used as a structural piece of wood or to be left outside. In summary more suited for furniture, floors, balustrades etc and for those jobs requiring a hard surface such as worktops. Also good for burning but more interestingly was used for smoking. We take that to be food products not a cigar replacement! 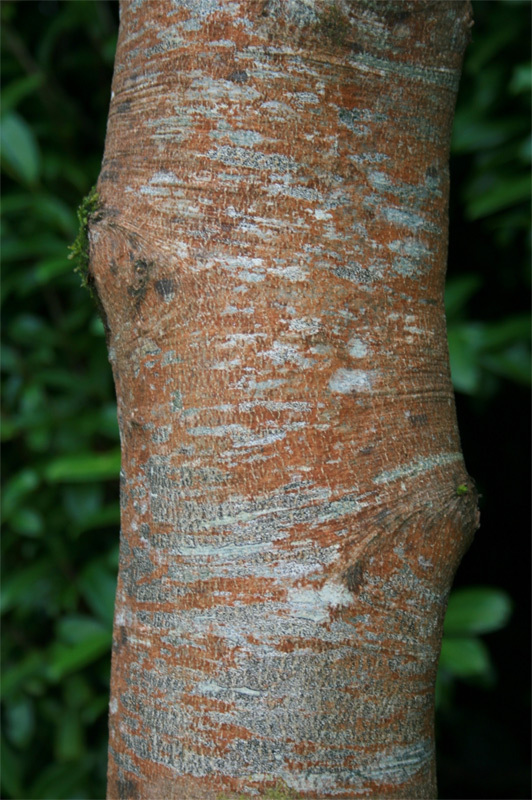 Fagus Sylvatica is considered a native tree to our UK shores but like most things this really depends on how far back you look, after all, apparently we are all African. If Jesus was on holiday in the UK, noticed a well trimmed hedge and asked how long has that been in this land then someone would have said "about 4000 years your Lordship". You can plant in most soils as Fagus Sylvatica has become the dominant tree on acid and alkaline soils. Climate change may affect Common Beech in the future as it tends to prefer humid year round conditions. This means those in the North West (above and to the left for those without a compass) will possibly thrive more than their dryer relatives down south. 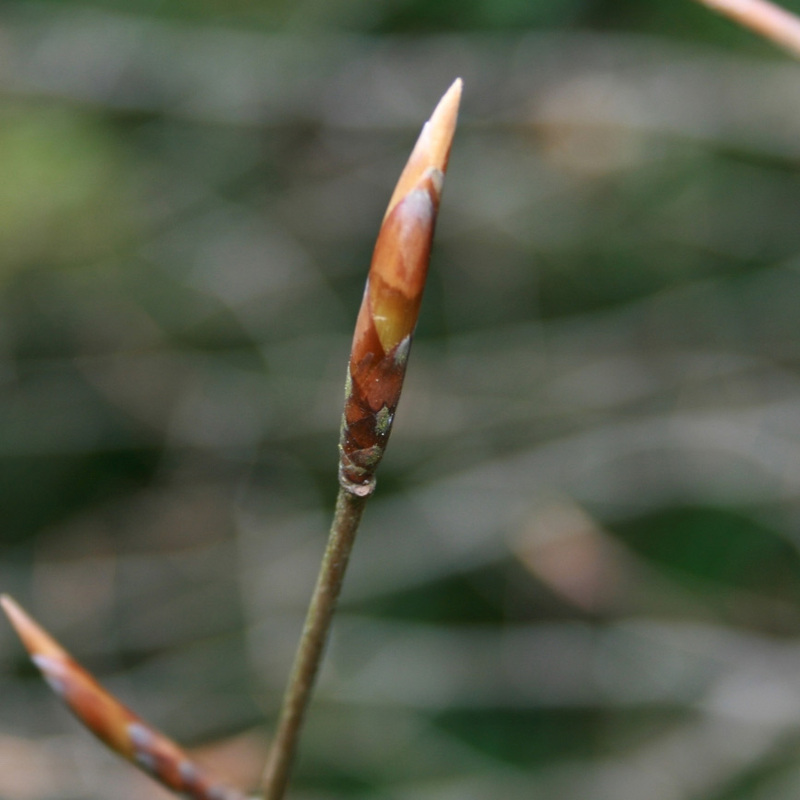 New leaves or breaking bud is triggered by day length and warmth from the middle of April to the start of May. The end leaf will release a hormone that stops any further buds from breaking through. This is important to know if you are planning to prune your hedge during this time. 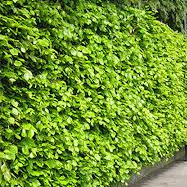 In May, if your hedge is playing nice with you, expect it to bear small, pale green flowers that will be mostly female. Speaking in a loud voice discussing a local show sale and quickly looking at the hedge to see if the flowers looked up with interest is not the best way to determine male or female flowers. Unfortunately you will have to wait 3 to 8 decades before seeing these however for the body freezer people out there you are in for a treat. 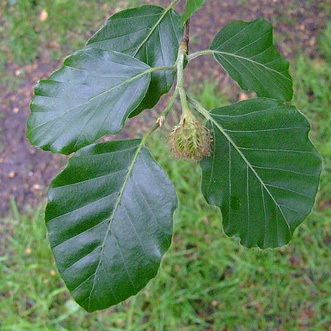 The Common Beech will produce seeds which are called Beechnuts but don't expect them too often as the tree is a bi-annual cropper. This means expect a good crop only every other year. The nuts are edible for humans if not ingested in large quantities because of the tannins they contain although historically these were soaked or roasted to release them and then ground to flour. Ok to feed Beech nuts to pigs and deer but not for horses. 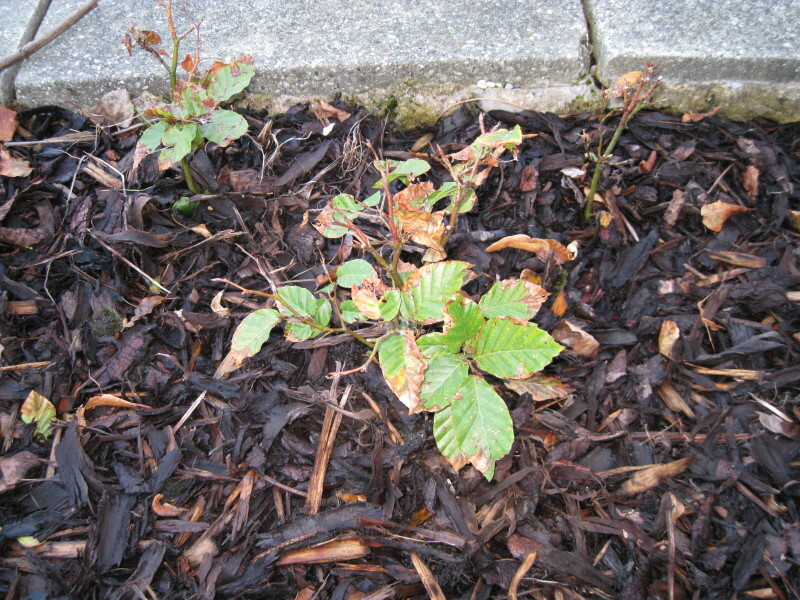 Our Common Beech hedging trees are sold as plug plants, in other words the roots are encased in compost. This means that planting can be carried out at any time of the year, provided they are watered in periods of drought, compared to bare-root plants which can only be planted during the plants normal dormant period (November to March). All of these trees are UK grown, which is important for successful establishment.